After our visit to the Bridge Road Brewery, we had free time. Most of us retired to our rooms, roamed the town or kicked handegg* till we were sore. I had a constitutional after having pulled an all-nighter. I roughly recall being dragged out of our gorgeous accommodation to Ben Kraus’ pub the Tanswells. In my somnolence, I’m not really sure how it happened but I ended up at Provenance. It wasn’t too far from Tanswells Hotel and Tristan had made the snap decision to call them to see if they had a table for two. They did. Being the consummate food blogger wankster that he is, Tristan ran back up that bloody hill to our accommodation to get his camera. In contemplative solitude, what’s a girl to do but drink. I started with Poire William Bertrand eau de vie. It’s been way too long since I had pear (poire) eau de vie. I most certainly wasn’t going to drink any Bridge Road beer when I could get that from its maker direct, was I now? Great that they had it on their drinks list though! I warn you in advance that this is going to be a very long post: Tristan had the omnivore degustation while I opted to have the vegetarian: I simply wasn’t in the mood for meat – yes, strange but true. I blame it on the pseudo-flu (or that ‘100 day cough’ as Ed called it) from which I still have not yet fully recovered, three weeks on. 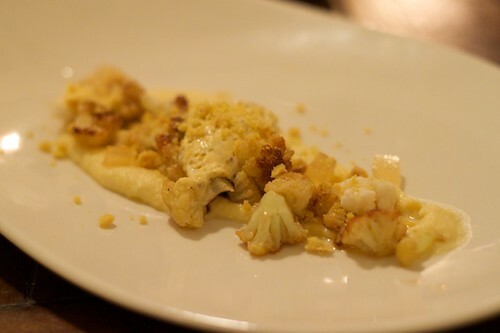 The first course was the same for both of us – butter sautéed cauliflower, cauliflower purée, mustard sabayon, polenta shortbread crumbs and brown butter jelly. Yep, for a vegetarian course, it has a lot going on. Personally, I love cauliflower (though I suspect it may have upset my tummy later that night – it’s a gassy vegetable). I love its presentation – reminds me a little of a savoury version of Roelofs’ Cafe Rosamond edible sculptures. This entry was posted in eatie-foodies dining out and tagged Beechworth, degustation, Provenance, vegetarian food, Victoria on September 27, 2010 by gem. Once, I used to be a damn fine pescetarian. I was a poor uni student and didn’t buy much meat, so gave it up for a bit. Then I got diagnosed with IBS and had to abstain from it for weeks at a time. However, I’ve always loved vegetables. Even as a kid. I feel guilty that I don’t do my body enough favours by eating just vegetarian fare, especially as I feel so good after eating it, digestion-wise. This was what compelled me to try out a very modest looking establishment by the name of Vina Vegetarian Restaurant one day as I walked up a main road in Newtown, Sydney. The once strict vegetarian T was keen, as was my host C who is currently a practising vegetarian. When you first enter, a unit displaying some Asian vegetarian groceries is visible for inspection and purchase. C thought this was pretty cool, and I must concur. The three of us sat down to enjoy some complimentary tea, and we studied the menu. We all chose entrées and mains. A lovely old fellow came out and presented us with bean sprouts. I am mad about bean sprouts! T had mock BBQ pork buns, C had crispy fried vegetables and I had crispy fried tofu. I loved mine best – it had this delicious shredded dried stuff on it that tasted very much like chicken, and sesame. I swear the dipping sauce tasted like fish sauce (or patis as we call it in Filipino/Tagalog) but Vina is pretty strict about such things. 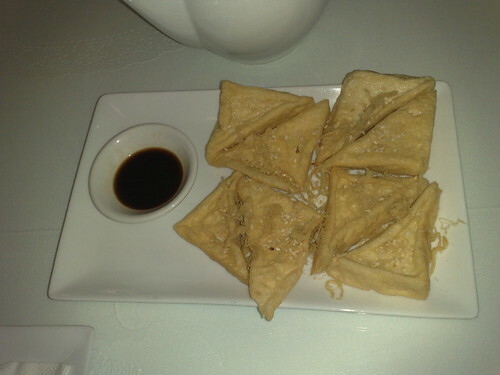 I must confess however that the crispy xui cao I persuaded all three of us to share did not live up to expectations. 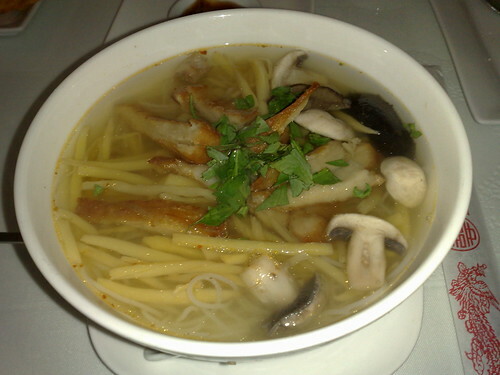 For mains, we all had rice noodle soups – T the mock beef noodle soup, and C and I both the same: bamboo rice noodle soup with crispy veggie chicken. Gosh, I love bamboo shoots – they are delicious and the texture is just so appealing to the tongue, and the serving was very generous! The chicken tasted more like chicken skin, and resembled it in texture, but it soaked up the coriander and chilli laden broth very well. 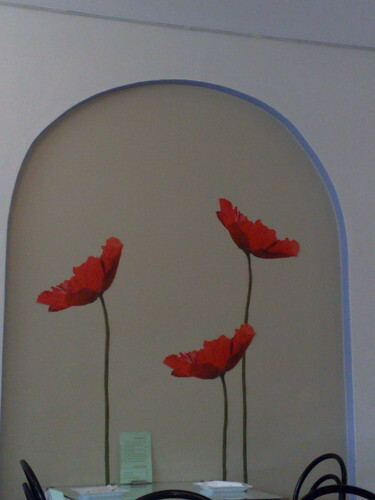 Despite the sparse décor, there were still some nice touches: I liked the painted flowers on one part of the wall, and the chopstick envelopes that also happened to have instructions on how to use the dining implements. The service was friendly and attentive. I felt like the three of us dined like kings for very little cash. The menu claims that it is strictly vegan, with the exception of dessert. I’d personally recommend that one doesn’t dine here thinking that this place will serve vegetarian versions of meat or fish, but rather as a place that serves tasty and varied Vietnamese vegetarian fare. None of us tried any on the night, but you can also have salads, dry noodles and fried rice dishes too. This entry was posted in eatie-foodies dining out and tagged Newtown, Sydney, vegetarian food, vegetarian restaurants, Vina Vegetarian Restaurant on February 21, 2010 by gem.